Corporate events. The term has a stale “they’re all the same” connotation. You go because you have to, even though it’s supposed to be a “want to” outing. Not at Pure Pong in the Pearl! Pure Pong has hosted several corporate events for clients such as Nike and Ruby Receptionist. No matter the size of your office, large or small, we host them all! It’s something different and actually fun. You get to engage with your coworkers at a table at which you do not hold meetings, discuss contracts, or banter with clients. You get to play Ping Pong! Find out why Ping Pong is the number one brain sport, and can it really improve workplace productivity? You bet! 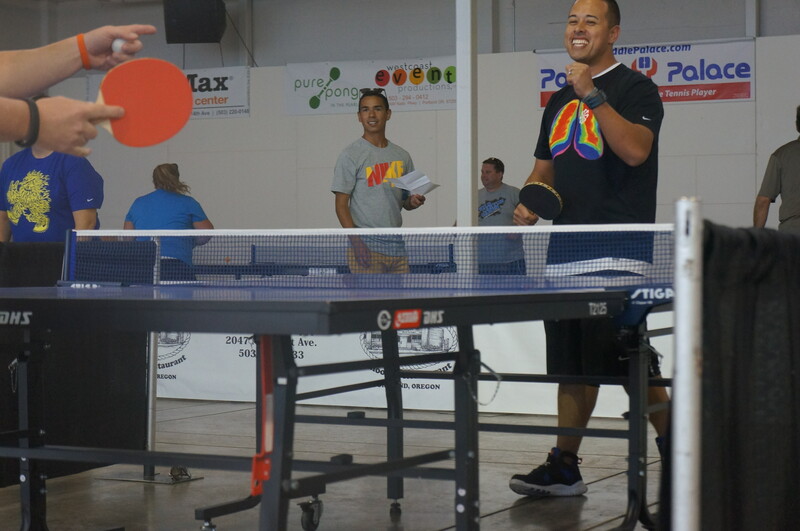 A group from Nike enjoying some Table Tennis at a Pure Pong corporate event. 10 Steps to a Pure Pong Corporate Event: Pure Pong is willing and able to accommodate most any format, though here is a rundown of what some of our clients have done. Everyone enters to find great music, festive lighting, and cocktails awaiting—so excited to get their pong on. Idle, competitive, good, bad, impressive, uncoordinated, and fun Ping Pong is played for some time. Guests enjoy a catered dinner, appetizers, or both! Everyone is finishing their supper when…low and behold! Two Portland Table Tennis extraordinaires (with prestigious titles ranging from Olympian to Blitz champion) emerge! They draw their paddles, and put on a fun exhibition show—dazzling guests with top spin, back spin, slices, and whatever other crazy move you can imagine. Inspired by what they just witnessed, guests receive some fun and expert coaching from USATT certified Pure Pong coaches. Feeling a little more confident after expert instruction, the game is on. Guests participate in a mini tournament organized by Pure Pong coaches. It’s as competitive as you want to make it! Everyone plays till their heart’s content, some come out on top, and a good time is had by all. Everyone returns to the office the next day, rejuvenated with tales from the evening and good-spirited trash-talk. While this format has pleased many of our clients, feel free to tailor your event to suit your needs! See standard event package. Pure Pong is able to work with a variety of budgets to create an entertaining and engaging event for your office. If you’re interested in hosting a corporate event, please contact Duane Smith for information on rates, and share your vision! 971.570.9634 Pure Pong can also deliver the party to your office!